This week, we’ll look at a couple big names in Pawtucket and elaborate on their early season struggles. Further down, we have some quick looks at promising middle infielders in the low minors, and some notes on the debut of a rather rich 19-year-old. After hurling 37 innings with a 0.86 ERA and a 2.26 FIP in Portland last season, Rodriguez hasn’t missed a beat this year, dominating Triple-A competition to the tune of a 2.86 ERA in 34.2 innings pitched. The key for Rodriguez ever since coming over to the Red Sox system was his dramatic improvement in limiting free passes. Rodriguez dropped his BB/9 from 3.16 to 1.93 after the Andrew Miller trade in 2014, and it’s gone ever farther down in 2015, as it now sits at a stellar 1.30. The southpaw has developed his secondary pitches very well over the last calendar year, allowing him to hit the bottom of the zone much more consistently, generate (slightly) more grounders and avoid those long fly balls. While he’s been great in Pawtucket as a whole, his recent games have left something to be desired. Against Columbus and Indianapolis, Rodriguez only registered five innings per and gave up six runs combined in those two starts – matching his total runs allowed from all of April (24.2 IP). 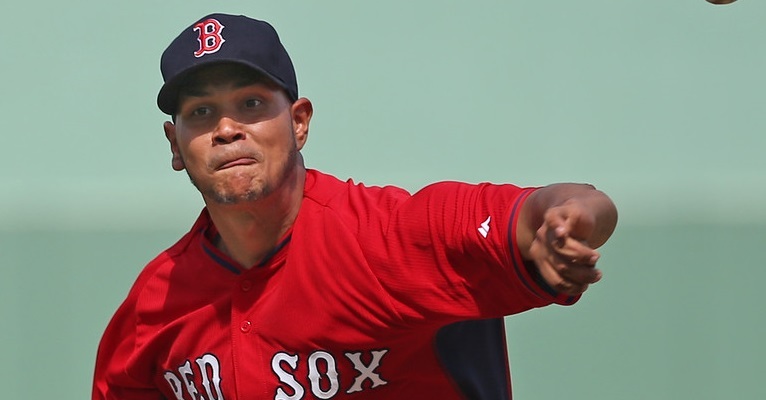 One can surmise that’s why Steven Wright was chosen over Rodriguez for the spot start on Sunday, but considering the need for back-end starting pitching on the major league squad, Rodriguez is a good bet to be called up sooner rather than later. It seems like you hear nothing but great things about Rusney Castillo, but for all of his stats in Pawtucket, the Red Sox have good reason to not think he’s ready for the majors just yet. Despite his .308/.361/.462 in 16 games, Castillo has been described as looking out of sync in the field and in “spring-training mode”. Alex Speier described a three-inning sequence in a game against Indianapolis in which Castillo made several mistakes, such as getting caught drifting too far off of 3rd base and timing a slide so badly that he rolled his ankle on the base itself. Castillo is a great player and he’s ticketed for right field in Fenway sometime this season, but after missing a big chunk of spring training and April with oblique and shoulder injuries, he still needs more playing time until he gets the call. What Asuaje lacks in power, he makes up for in plate discipline. The infielder has put up .408 mark in Portland so far, and has taken 24 walks to just 21 strikeouts. He’s a very tough out, as Asuaje makes good contact and his great eye at the plate will make pitchers work. While he can get to first base with no issue, it’s getting to second base in the same inning that’s the problem – Asuaje seldom attempts to steal, and any semblance of the power he showed last year is notably absent now. Between Salem and Greenville last year, Asuaje slugged .526, and so far with Portland, it’s a sub-par .353 with a .084 ISO. Nevertheless, that’s still good for a .294 TAv, and his versatility in the field will make him a good utility player down the line. One thing you have to understand about a pitcher like Trey Ball is that he was – and still is – pretty raw, even for a first-round pick. In Salem, he’s been improving on a few fronts, such as inducing more grounders and improving his fastball command, but he hasn’t taken a major leap just yet. His changeup is his premier pitch, but it needs a good fastball to set it up, and while Ball’s got one velocity-wise, he currently has mediocre-to-decent command with it. If that discourages you, don’t fret: Ball is only 21 years old, has a tall, projectable frame, and is still on a good developmental track. Sometimes, high school pitchers just need more patience than anything. Wendell Rijo is finding it hard to play to his strengths so far in Salem. He can work a walk and has good speed on the bases, but just cannot get on base in 2015. A .298 OBP limits the young prospect, but when you see that he blew through Greenville with a .273 TAv at just 18 years old, some leeway needs to be given. Rijo checks in at a light 170 pounds, and will need to add some strength to augment his game as he moves forward. Glimpses of his decent gap power can be seen in Salem this season, as he’s hit ten doubles, a triple and two homers in 22 games so far. Rijo projects to be a regular at the keystone, provided he can hit and work on his fielding mechanics. This isn’t a recap of what he’s done, but more of a step forward for the 19-year-old Cuban. Moncada will make his debut for the Greenville Drive tonight after playing in extended spring training down in Ft. Myers. He would’ve been with the team earlier had he not strained his shoulder sliding into second base earlier this year. Like Castillo in Triple-A, he needed more time to get into game shape. Moncada has been playing second base, but SoxProspects.com has his five-tool potential playing out anywhere in the field, provided he gets consistent reps at the position he’s manning. If that doesn’t get you salivating, Moncada is a switch-hitter with plus contact and plus power. Did I mention he’s still a teenager?